Pixar certainly seems to be in a bit of a down period right now. Brave was a decent enough film but felt a little confused, whereas Cars 2 found them at their absolute nadir. 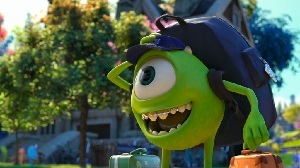 It may be because we’ve only recently come out of their best run of features – Wall-E, Up and Toy Story 3 – but Monsters University seems to the continue the trend of lacklustre features. Taking Mike (Billy Crystal) and Sully (John Goodman) back to university, this prequel to Monsters, Inc. is merely decent where the original was fantastic. Taking cues from Animal House and the like, this odd couple comedy produces some decent laughs, but doesn’t seem to introduce anything new to the Monsters universe. Worse still, the new characters aren’t especially memorable. Sure, the two legged Art (Charlie Day) gets some great lines and is a masterful example of character design that harks back to Henson’s Muppets, but the likes of Helen Mirren (Dean Hardscrabble) and Nathan Fillion (Johnny) seem wasted. Being a prequel, the film suffers insofar as we’re reasonably sure how things are going to end up, but there’s still some charm to be found in Mike and Sully’s difficult journey towards friendship. Crystal and Goodman are just as good in the central roles as the first time around, but the dialogue feels a little sparse in comparison to the original. That being said, there are some heartfelt scenes here, particularly with one of the recurring motifs. Whilst it would be foolish to suggest that Pixar will never get back their mojo, I am certainly looking forward to their future non-sequel films (The Good Dinosaur sounding much more interesting than Finding Dory, in my humble opinion.) Monsters University gets the job done, and certainly isn’t anything like Cars 2, but it perhaps doesn’t deserve having people rush out to pay cinema prices (much less 3D surcharges). This entry was posted in Film Reviews and tagged Animation, Childrens, Comedy, Science Fiction by Stuart Wilson. Bookmark the permalink.